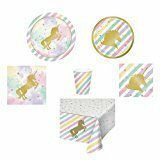 If you are throwing a unicorn theme party or you have a child that loves unicorns, these DIY Unicorn Ice Cream Sundaes are just what you need. 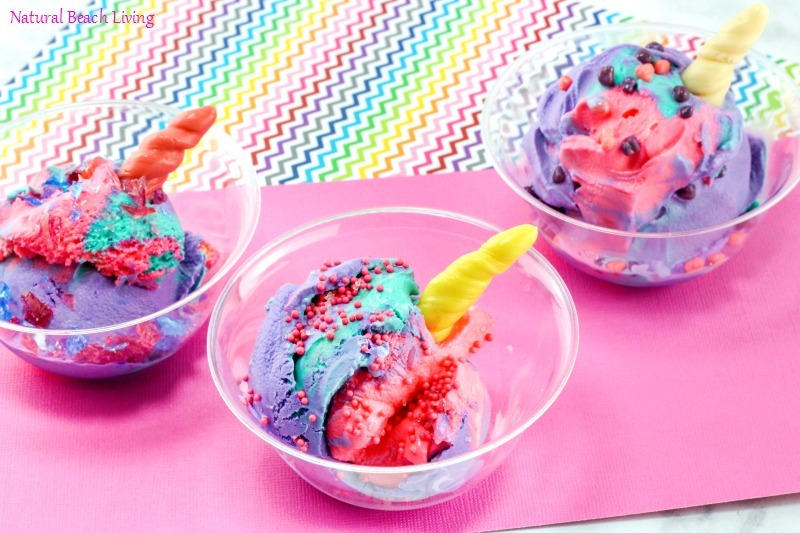 This Unicorn ice cream is so easy to make, and kids and adults love it! 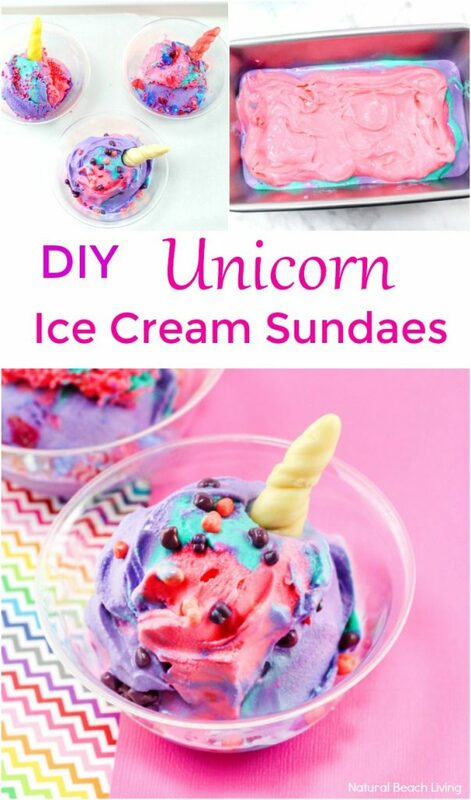 If you are looking for a fun ice cream idea grab the instructions below and make your own unicorn ice cream. 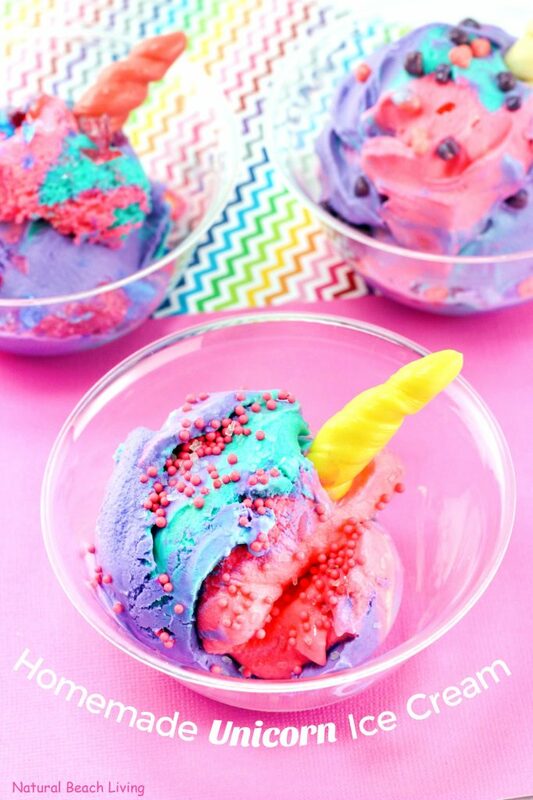 It’s the perfect treat for any rainbow or unicorn fan. 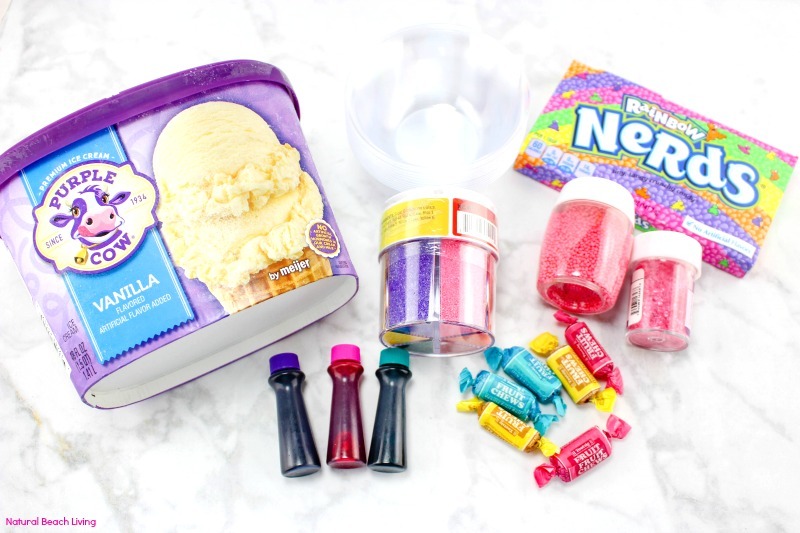 What you will need to make your Unicorn Ice Cream Recipe is in this picture below. However, I have it displayed in list form towards the bottom of the page. Enjoy! 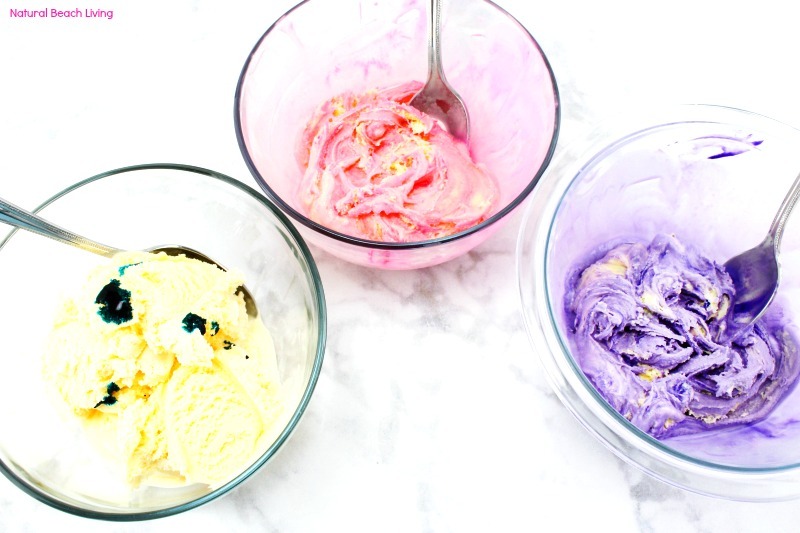 Start by dividing the ice cream into 3 bowls and mix in a couple of drops of food color into each bowl. 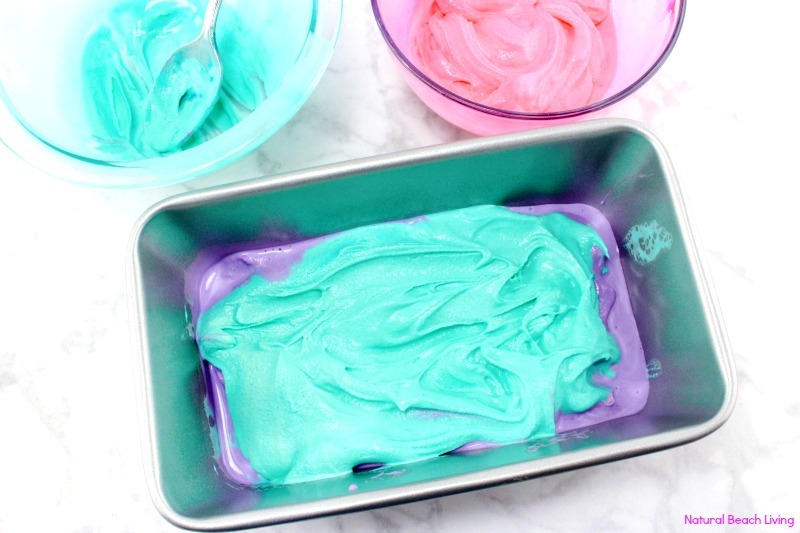 Layer the ice cream into a loaf pan one color at a time. 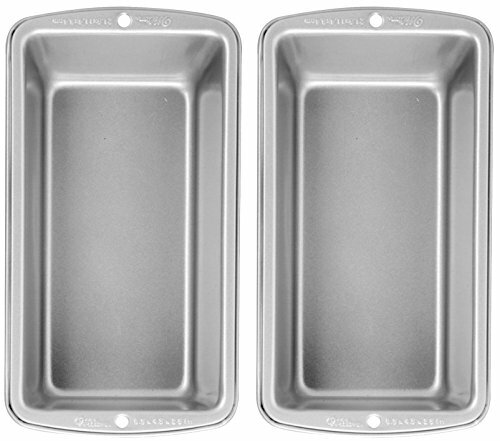 You can use a silicone spatula or an icing spatula to spread the ice cream layers into the pan. Place the pan in the freezer for 1-2 hours until the ice cream is hard again. 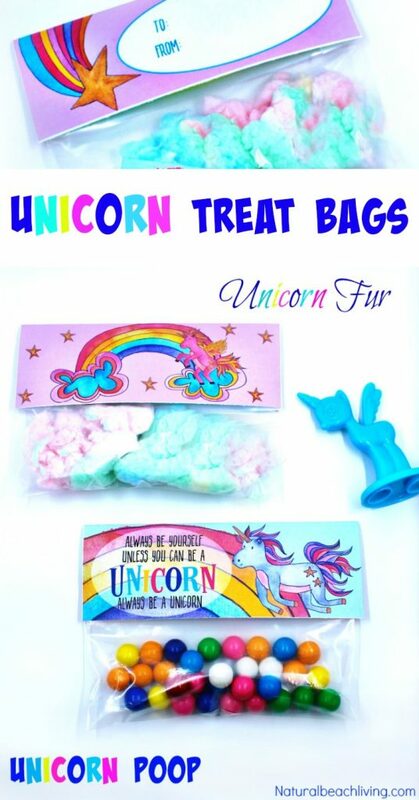 To make the unicorn horn unwrap a fruit chew and place in the microwave for 3 seconds. 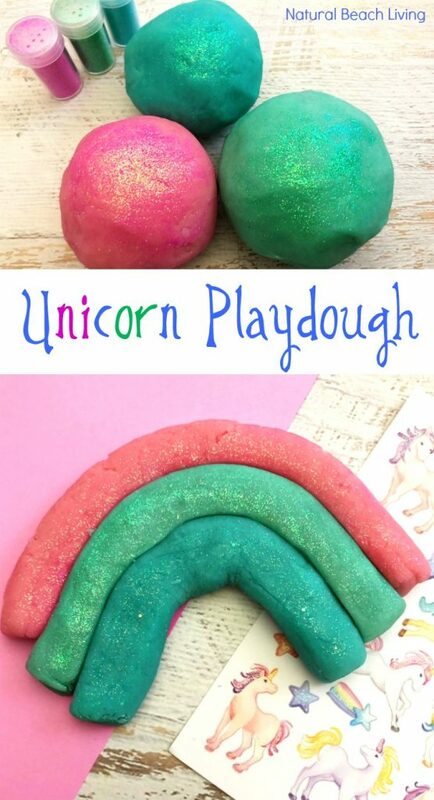 Next, roll the fruit chew into a ball and then pull and twist it until it looks like a unicorn horn. Repeat this step with the other fruit chews. Take the ice cream out of the freezer and scoop it into 4 sundae bowls. Make sure to get all the colors in each scoop. (start at one end and scoop until you reach the other end, this will give you all 3 colors with a perfect scoop). 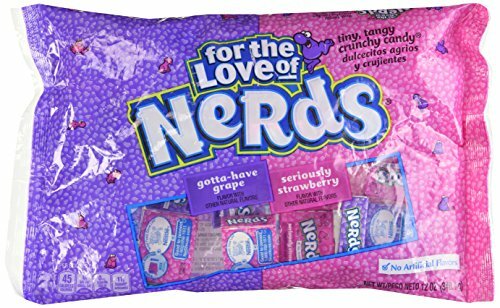 Delicious and so pretty! 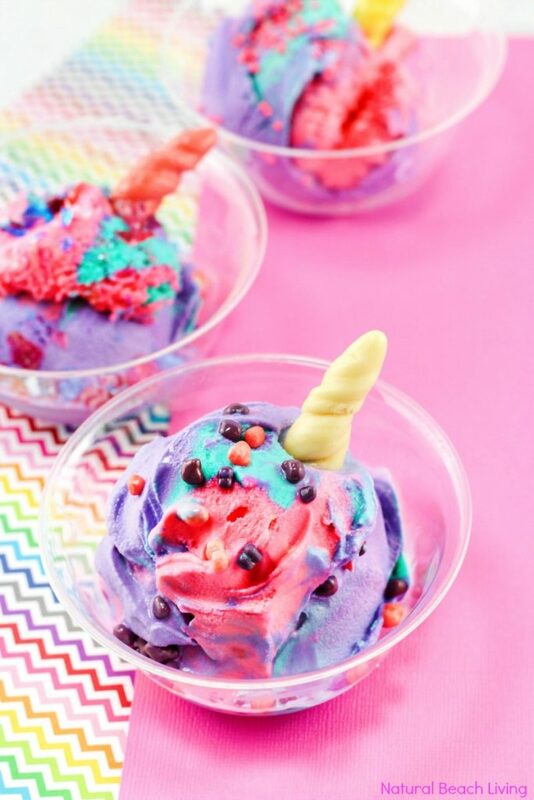 Sprinkle different candy and sprinkles on each sundae for a magical look and put the unicorn horn on top of each sundae. 1. 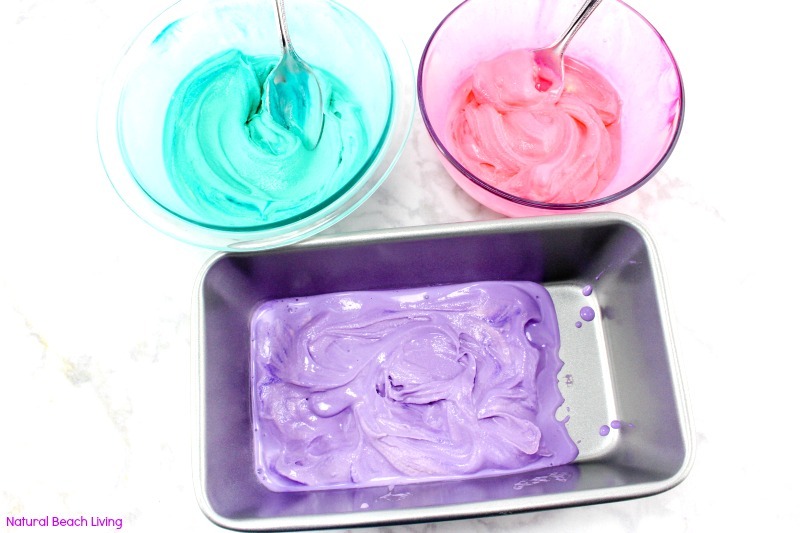 Divide the ice cream into 3 bowls and mix in 2 drops of food color. 2. 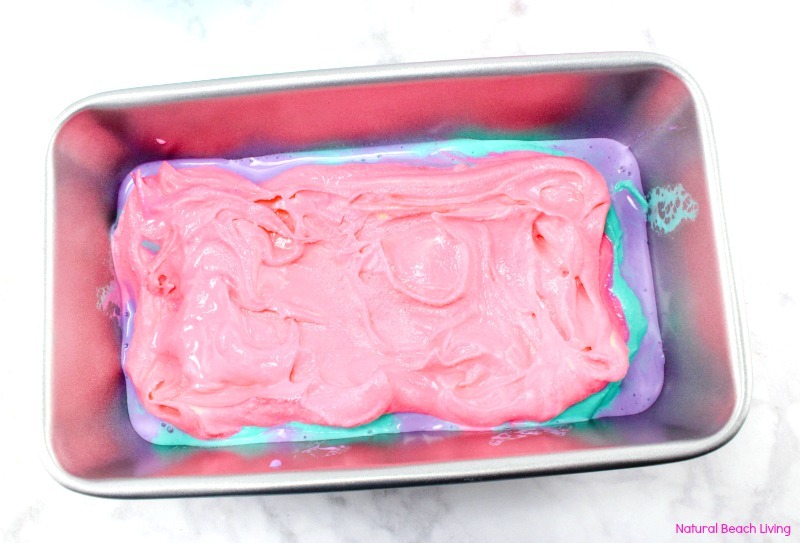 Layer the ice cream into a loaf pan one color at a time. Place the pan in the freezer for 1-2 hours until ice cream is hard again. 3. Unwrap a fruit chew and place in microwave for 3 seconds. 4. 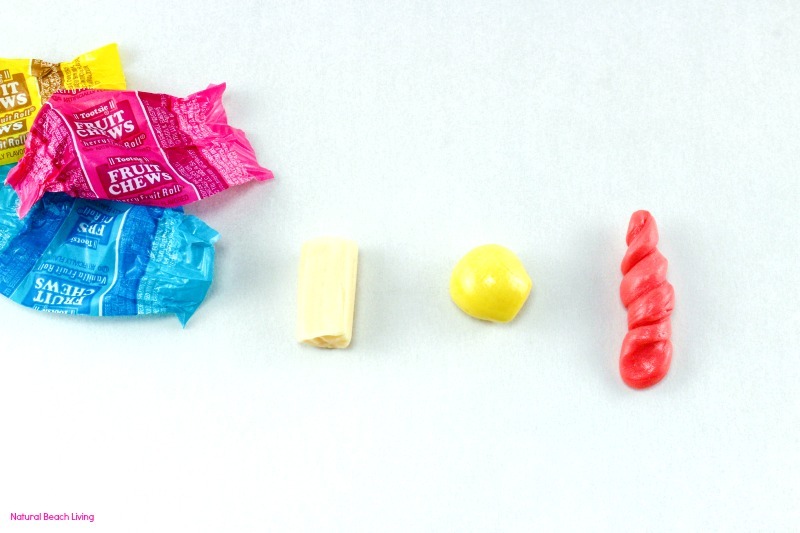 Roll the fruit chew into a ball and then pull and twist until it looks like a unicorn horn. Repeat this step with the other fruit chews. 5. Take the ice cream out and scoop it into 4 sundae bowls. Make sure to get all the colors in each scoop. (start at one end and scoop until you reach the other end, this will give you all 3 colors with a perfect scoop). 6. 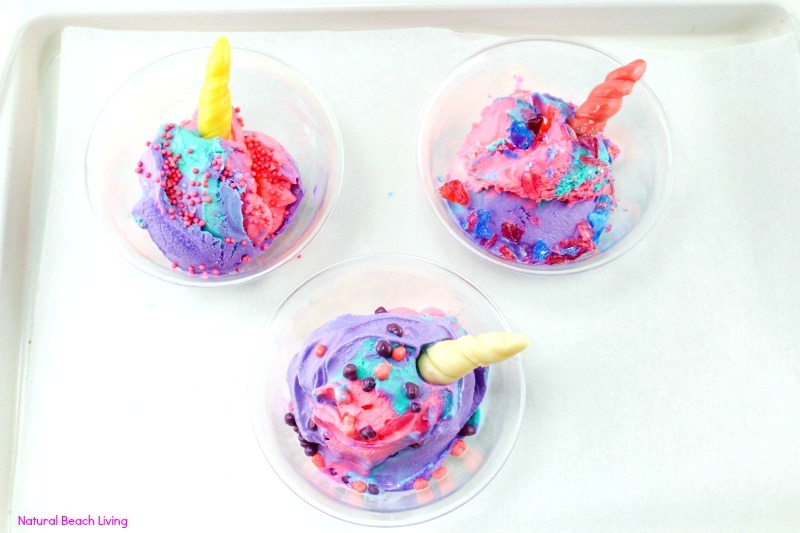 Sprinkle different candy and sprinkles on each sundae and put the unicorn horn on top each one.